Choosing to interact with others in an online forum provides an opportunity for exploring one’s own identity. With each new group joined, a person must make decisions about self-presentation and react to an audience. Such decisions continue as social interactions occur and relationships develop. This paper discusses how bloggers who have affiliated with each other to form a loosely knit community develop largely pseudonymous identities along with norms surrounding the development and performance of identity. The study is ethnographic and longitudinal, examining a community of academics who blog and comment alongside each other in a diaristic manner. Focal areas include blog elements through which identity may be expressed, namely (1) Name and blog title; (2) Profiles; (3) Post content; (4) Voice; (5) Affiliations; and (6) Visual design; the effect of pseudonyms on blog authors and readers; and how issues of privacy and trust are manifest in the community. Blog identities are constructions that develop over time. The genesis of a blog is a moment when several identity decisions must be made (i.e. username, template). These are not immutable decisions, but nonetheless impact both the first impression one will make upon the blogging community and the early experiences a blogger may have. As bloggers weave the narratives of their lives into posts, these narratives, which are acts of self-construction and self-depiction, express a sense of author agency (Bruner 1994). Through their stories shared online via media such as blogs some individuals are seeking status, also relying upon acts of self-presentation (Lampel and Bhalla 2007). Reputation and appearance also are important identity factors, contributing to a sense of trust within virtual communities (Daneshgar and Ho 2008). Thus identity construction is an ongoing activity—whether conscious or not—in which bloggers regularly engage. Blogging is not a topically confining medium, and not all bloggers explore identity issues. Herring et al. (2005) classified blogs as filters, k-logs, and personal journals. The first two tend to be repositories and reconfigurations of content on particular topics or issues and may be fairly impersonal, but it is these personal journals that allow one to readily and directly explore identity issues on a blog. Technorati (2008) uses a different classification system, which considers content and authorship, using the labels personal, professional, and corporate. Technorati’s (2008) State of the Blogosphere report provides some insight into general blogging demographics and practices, including identity-related topics. In a survey of bloggers they found that one-third of all bloggers had privacy concerns related to their identities, based on possible impact on family and friends as well as disapproval of employers, family, and friends. Relatedly, Madden et al. (2007) found that one-half of all adults have searched for themselves or others online, demonstrating an awareness among Internet users that identity information may readily be found online. Still, sharing information about oneself in an online forum is a key way of attracting readers and participating in community, regardless of the level of fidelity between one’s online and offline identity. Lampe et al. (2007) found that Facebook users who have more extensive profiles also have a greater number of friends in the network. Further, associations with others provide additional cues about identity (boyd and Ellison 2008). Blogs differ from Facebook in terms identity expectations, but even with the freedom that blogs allow for exploring new identities or obscuring one’s identity, the blogosphere has not become a free-for-all of anonymous authors. In fact, only a small percentage of people blog without any use of name, and over time many bloggers are more likely to use their real names (Herring et al. 2006). However, self-disclosure and extraversion have been linked to the size of one’s blogging network (Stefanone and Jang 2008). Through these assembled studies, it becomes clear that identity issues play a critical role in online networks. But how do these identities form, and what role do community norms and interactions play in their development? The answer to this question is important for two reasons. First, it will help better explain how people chose to represent themselves online and why they make these choices, which has implications for how people come to know, understand, and communicate with others. Second, knowing how successful identity development and community interactions take place organically can help those working to create intentionally designed online communities such as professional development or support networks better understand what profile and communication options and community rules their members might like. The purpose of this paper is to answer the above question in the context of a blog-based community. A blogging community differs from other online forums such as discussion boards in the sense that individual members have ownership over defined spaces and social networking sites in the sense that no clear entity either owns or defines the community as a whole. Specifically, the research questions for this longitudinal ethnographic study are: (1) What elements constitute and contribute to a blogger’s identity? (2) Why do bloggers construct alternate or pseudonymous identities? (3) How are these individual blogger identities shaped and affected by participation in the larger blogging community to which they belong? These questions are addressed via an analysis of the practices and norms that govern identity development and management in a specific blog-based community, including a look at how blogging identities emerge and develop over time, along with how factors related to participating in a public forum, such as trust and privacy, affect one’s identity choices. This paper represents part of a larger ethnographic study of a blog-based community. The community, which I have come to call “Blogademe”—a term adopted from one of the bloggers (see kfluff 2006)—consists of an informal network of blogs written by people who identify themselves as academics. They are predominately from North America, although others are not excluded. The North American linkage seems to be related to shared language, culture, and educational system. This community is one among many that might be found in the blogosphere. Other researched blogging communities include knitting bloggers (Wei 2004; Minahan and Cox 2007), mommy bloggers, and political bloggers (Bishop 2009). Most of the Blogademe blogs are sole-authored by people who use pseudonyms and obscure identifying details to varying degrees. They blog about a wide variety of topics, some academic and other not, generally chronicling their lives, interests, and concerns. Within the realm of academic topics, they mostly discuss job experiences rather than specific details of their scholarship. In other words, these are not topical research blogs written by academics but could more appropriately be classified as academic life or diaristic blogs. Despite this classification, the blogs are not mere online diaries. Rather, they serve as discursive platforms for individuals who collectively write about their lives in their own space and reciprocally comment on posts written on other, topically similar blogs. This collection of blogs previously has been identified as a community based on studies of both its characteristics (Dennen 2006) and the interactions among its participants (Dennen and Pashnyak 2008). One might liken the role of individual blogs and bloggers to the blogging community to how individual people and their houses form neighborhood communities when they interact with each other, replacing the connection via physical proximity with one based on topical proximity. This naturalistic study has relied heavily on participant observation. As a researcher, I have observed and engaged with these bloggers from 2004 onward. This approach has been used by others studying cultural and discourse elements of online communities over time (Gatson and Zweerink 2004), and has been important for developing a deep understanding of the range of beliefs and practices that are core to this community. Data have been collected through two main methods. First, ongoing observation of the blogs themselves has been used to develop a strong understanding of this blogging community and the various players within. I have observed a core of 200 blogs during this time, with a large number of additional blogs entering the fray at various points in time. These blogs are monitored using RSS feeds, and comments on relevant posts are monitored on a case-by-case basis as deemed relevant to the research. Both field notes and blog archives serve as the documentation of these observation efforts. Second, forty bloggers and commenters were interviewed about their experiences within this particular community. A semi-structured interview protocol was used, asking why they participate, their blogging and commenting habits, types of experiences they have had in the community, and its impact on their everyday lives. Those interviewed comprise a purposive sample selected to represent the diversity of the community in terms of longevity of blogging, role (blogger, commenter, lurker), gender, field of study, and position in academic community. First, structural, visual, and communicative elements of the blogs were examined to determine which contributed to a blogger’s identity in terms of both identity development and perception by others. Next, comments on how bloggers had constructed and developed their own identities were culled from blog posts, comments, and interviews and grouped by commonalities. Finally, general comments in interviews, blog posts, and comments were coded based on themes that had emerged in the field notes as relevant to identity, specifically voice, trust, privacy, and pseudonymity. As a naturalistic study, traditional notions of validity and reliability do not apply. However, developing trustworthiness and credibility as a researcher following the guidelines described by Lincoln and Guba (1985) was a consistent process focus throughout every phase of the study. Observations and interpretations are based on prolonged engagement with the studied community documented with detailed field notes. Data were triangulated by both type and source, and selected member checking was used to confirm accuracy of interpretations. Readers might make modified or petite generalizations of these findings to other similar communities, as recommended by Stake (1995). It should be noted that throughout this study the participants are referred to as bloggers for the sake of expedience, but they are not individuals who blog in isolation. In practice, they also are active readers and commenters on other related blogs, and it is this reciprocal action of posting, linking, reading, and commenting along with sharing a general category of identity (i.e. academic blogger) that makes these bloggers part of a community. Their blogs have been analyzed here not as individual artifacts, but rather as a part of a collective community with its own overarching identity. Bloggers readily distinguish themselves by developing identities that are just as unique as the real person behind the blog. There were six main elements through which bloggers expressed their identity in the Blogademe blogs: (1) Name and blog title; (2) Profiles; (3) Post content; (4) Voice; (5) Affiliations; and (6) Visual design. Each of these elements is discussed below. Note that while individuals make identity choices that express who they are, at the same time these choices tend to reinforce community norms. In other words, they demonstrate an awareness of and desire to belong to the larger community not just through their interactions (e.g. links and comments), but also through the very design of their blog. Usernames and titles often provide clues to the blogger’s primary identifications in life. The Blogademe bloggers most often use pseudonyms so their blog names do not provide a direct link back to their real life identities. Of the two hundred blogs regularly observed in this study, only four were authored by people using their legal names. Pseudonyms may be carefully constructed or quickly chosen to gain entrée into the blogging world. In the former case, bloggers tend to have a strong affinity for their usernames. In the latter, they may be inclined to change or alter their names, as discussed below. Pseudonyms may indicate gender, field of study, academic position, and attitude. Blog titles often incorporate or expand on pseudonyms, providing additional cues to the content of the blog. For example, Psycgirl of Stressful Times for Psycgirl is a female graduate student studying psychology who blogs about the challenges she faces while completing a Ph.D. in a competitive field and Astroprof is a professor of Astronomy. Dr. Brazen Hussy is a postdoc with a keen sense of wit who enjoys making mixed drinks and chose her name based on one found in a bartending manual, and Prof Mama juggles both her job as a professor and motherhood. Whereas pseudonyms have largely become the norm, anonymity is generally not accepted for either bloggers or commenters. Trust and reciprocity are key related issues. A blogger presents and trusts others to respect her pseudonymous identity and in turn expects others to do likewise. It is the norm to choose a name and use it consistently as a blogger and commenter. Psycgirl noted, “I don’t like anonymous comments. It partially freaks me out that someone found me and I don’t know who they are” (interview). Although name and title changes are simple to do, such changes occur infrequently. Once an identity is well formed under a particular name, there are greater consequences to changing one’s name. This is not to say that blogging names and titles are never changed, but bloggers are aware that when they change names and titles—and particularly URLs, which often are changed during these switches—they are likely to lose some of their regular audience, at least temporarily. Thus, some bloggers keep names that they feel are no longer or perhaps never were a good fit. For example, Geeky Mom shared, “I can’t believe I put mom in the title.” She now blogs under her real first name, but retains the Geeky Mom title for her blog. Occasions when bloggers are most likely to make changes are when their privacy and comfort level have been compromised on an existing blog and when they undergo major life changes or transitions. For example, one blogger shared that she started blogging under her real name and then her blog was found by her mother, who googled her. Being found by her mother, who was not an intended reader, led her to change her blogging habits and use a pseudonym. I started blogging about a year and a half ago at a different blog. I had been reading academic blogs off and on. … I just got a lectureship, and was thinking about new identity. I was not a grad student even though I was finishing a dissertation. I was looking for an outlet for my changing life situation. Today marks the one-year anniversary of this blog, and also its—I don’t want to say “conclusion,” but let’s say—“transition” into a new space and a slightly different form. It’s probably true that it takes a while for any writer to get comfortable with a new genre, and I’m a little embarrassed to read back over my earliest posts—but I’m generally satisfied with the shape of this blog and the voice I’ve developed. I wish sometimes that I were a different kind of blogger (more on that in an upcoming post in my new space), but I’m just not, at least not right now. Flavia has thus intentionally used different blog names, titles, and spaces to explore her transitioning real life identity. Her name was only useful while it was an accurate descriptor, to be left behind in a move that evokes a sense of metamorphosis. However, she makes an effort to bring her audience along with her in the transition, recognizing the role that they have played in her personal development. The various blogging platforms all provide support for user profiles. Profiles can take the format of standard templates, such as those provided on blogger.com which solicit information on gender, age, work, location, and personal interests, or they may be more freeform “about me” pages featuring a narrative profile. Alternately, a brief (two or three sentence) profile blurb may appear in a sidebar on the main page of a blog. The content of these profiles tends to remain fairly static over time, providing just the most basic of information on a blogger—enough to potentially orient a new community member. Typically these profile statements are written in a way that touches upon the major roles a blogger sees herself playing (e.g. graduate student, biologist, wife) along with the main activities in her life that she anticipates writing about on the blog (e.g. writing a dissertation, photography) and any framing elements she finds pertinent (e.g. in the south, with an eye for fashion). That said, some bloggers opt for no profile, and thus readers must initially use their name, title and most recent posts as main identity cues. Over time, bloggers tell their stories, constructing a narrative of their lives. With varying degrees of openness, they share details about their families, hometown, life history, and relationships along with tales of their academic experiences. Readers who follow a blog regularly will come to learn these background details and assemble a fuller picture of the blogger. In turn, bloggers begin to use shortcuts in their language, referring to things such as “the awful incident of last year,” with the assumption that the reader knows the full story. Occasionally a newcomer will ask questions about the back story to a situation or an unfamiliar character on a blog, demonstrating how prolonged engagement gives the long-term readers a fuller sense of the blogger’s identity. The content of one’s posts indicates both the things that are important to them as well as the activities taking place in their daily lives. Blog content also is impacted by the notion that a blog is not a diary, but a dialogue with one’s readers. The determination of what is shared and not shared is carefully determined by a blogger, to communicate a desired persona in a manner that is comfortable to the author in a public forum. Voice, or writing style—including such elements as level of authority, tone, and phrasing—is a unique identifier of many bloggers. Words not only tell stories, but also indicate stress levels and senses of humor. How powerful is voice as a marker of identity? There have been instances in which blog comments have inadvertently been left unsigned, displaying the author as “anonymous,” and the regular bloggers were able to immediately identify the person who left the comment based on voice alone. In recognition of each other’s voice, sometimes bloggers will invoke or imitate another blogger’s style to make a point or emphasize their own feelings. Bloggers may be attracted to or repelled by each other’s voice and tone, and in interviews have privately shared that they no longer read certain other blogs within the community because they find the blogger’s style to be unappealing. Finally, a blogger’s affiliations, normally noted in a sidebar via blogroll links and graphical badges, also provide clues to identity. Blogrolls can be considered nods to other bloggers who are considered worthy of reading, worthy of a reciprocal link, or part of the general blogging community. Some bloggers feature multiple blogrolls, differentiating communities to which they belong or have an interest (e.g. mommy bloggers, knitting bloggers, medievalists, etc.). In addition to community links, bloggers also share links to favorite (non-blog) web sites, including those related to news, politics, humor, and humanitarian causes. Their sidebars may feature widgets with books they have read, music they enjoy, and photos they have taken. All of these are indicators of a blogger’s interests and beliefs and they help other community members both find things they have in common and discover new things. Most bloggers begin their blogging journey using a standard template, but over time they tend to personalize it. Some bloggers create avatars to visually represent themselves, while others may select partial photos of themselves (e.g., an eye, feet, or the back of a head). Still others may use images that they find pleasing or feel are indicative of their personality. Further, many bloggers share photos they have taken—often turning them into banners at the top of their blogs—and convey a particular setting such as a cityscape, a lab, a classroom, or a place where one might do fieldwork. These visual elements help create a space that is unique to each blogger. The bloggers see a clear connection between the design of their blogs and the images they portray. Anastasia, a blogger who has gone through multiple iterations of her blog, stated, “My voice has developed and changed. It’s less about complaining … My last template change was to be truer to my real life identity. To be more than just an angry graduate student” (interview). Further, the bloggers themselves have commented on how visual design and their blog reading patterns impact each other. Many bloggers subscribe to RSS feeds to keep up with a large number of blogs in an efficient manner, but click through to actually read posts on the blogs so they can experience the words inside the blogger’s visual space. Looking at the elements of blogging identity together, a fairly comprehensive persona emerges for each blogger. There are surface-level clues in the words, images and links chosen as a static representation—and then these clues are further reinforced by the content and voice of blog posts over time. There is a strong consistency among these elements, with profile characteristics typically performed in the content and voice of posts. Further, bloggers perform these identities in a manner that is consistent over time. In face-to-face settings, people present themselves differently based on context. A person may emphasize different personal characteristics and mannerisms at home and at work. A blogging identity, then, may be considered yet another context-driven representation of a person. In other words, blogging identities have their roots in face-to-face identities but highlight or downplay characteristics based on the community in which they exist. Supporting this assertion, ninety percent of the bloggers interviewed commented without question or prompt that their blogging identity is a representation of part of their face-to-face identity, and about one-half said that they feel like if they were to meet a fellow blogger in a face-to-face setting that person would be familiar based on online interactions. Interestingly, every time a blogger has commented in a blog post or interview about meeting another blogger in a face-to-face context the stated impression has been that while they may have been initially surprised by each other’s physical appearance they readily discovered the familiar voice lurking underneath and were able to begin deeper conversations than one expected during a first face-to-face meeting. Pseudonymity emerges as a key issue related to identity in the community, and is related to privacy. The concern with privacy may seem ironic when one considers that bloggers publish about their lives openly on the Internet, but nonetheless privacy is a real concern among the community. The bloggers are seeking community and an audience, but generally wish to maintain a distinction between their blogging selves and their everyday selves. They share details on the blog that they would not share with students, colleagues, or even family members. Often these details are inconsequential in terms of potential impact on their jobs and interpersonal relationships (in other words, no gossip or scandal), but they cross a line of personal sharing that bloggers do not want to cross. Further, they are well aware that the public nature of their online discourse could be misconstrued and do not wish to be considered representatives of their employer on the blogs. A few even go so far as to state on their blogs that they post as individuals whose personal opinions and situations that should not reflect on their institution. Pseudonymity, under these conditions, is often confused with anonymity. However, pseudonyms allow bloggers to maintain a stable identity, which is critical for community development. Conversely, anonymity is the absence of an identity and makes it difficult for community to develop. Certain blogs allow anonymous comments, and there is a clear distinction between how anonymous comments and comments attributed to known pseudonyms are received. Additionally, if multiple people post as “anonymous” it becomes difficult to distinguish voices and connect threads of conversation. More than 95% of the Blogademe bloggers are using pseudonyms for themselves (the remainder blog under legal names), and they do not believe themselves anonymous or unidentifiable. Pseudonyms are used not only for authorship purposes, but also to mask the identities of blog characters, geographic locations, disciplines, and institutions. Although a few bloggers naively hold the belief that pseudonyms will keep them from being identifiable when they begin blogging, they rapidly learn otherwise. Mary, who has alternated between her real name and a pseudonym on various sites, commented, “Even on the [pseudonymous] site I’m not really anonymous. Everyone [blogging with me] knows who I am. The pseudonym is kind of a fake safe device. If someone just stumbles on [my blog] they probably don’t know who I am.” Essentially, if a blogger is to make interesting and meaningful contributions to the community she will be revealing details that can be linked back to legal identity. Thus the pseudonym may provide a layer of distance between the blogger’s online interactions and their physical world, but it does not hold them permanently separate. The bloggers do not go to extreme measures to keep their physical and blogging worlds separate. Long-term community members may piece together significant clues toward determining a blogger’s legal identity based on accumulated details given over time. For example, posts about weather narrow down a geographic location, and those about major conferences tend to indicate a discipline. Thus, prolonged engagement, which tends to turn one into a community member, can result in merging awareness of one’s pseudonymous identity and their legal identity. However, people who randomly stumble upon a blog are far less likely to figure out a blogger’s legal identity or other private details of their lives from a casual reading. Connections between identities are not just due to sharing of geographic and disciplinary clues. Blogging voices and writing styles combined with situational content of posts often can suggest legal identity to people who are already familiar with the blogger. Dean Dad notes, “I try to keep it relatively anonymous, to the extent that I can. But if you knew me well and read the blog, you would know it is me.” Other interviewed bloggers expressed varying degrees of concern about privacy, but readily echoed the second half of Dean Dad’s statement. A few bloggers even put disclaimers in their sidebar, requesting that readers not “out” their identities if figured out. Still, their interest in participating in the blogging community tends to outweigh their privacy concerns. Pseudonym use also has become a norm among these bloggers. The initial bloggers who formed this community chose to use pseudonyms and openly addressed the privacy issue on their blogs in the early days, and then others followed suit. New Kid noted, “I wanted to use a pseudonym because it was the polite thing to do—everyone else was—and that seemed like it was the expectation. It seemed weird to walk in with a real name (interview).” In those few instances where community members blog under their legal names, their practice as bloggers predates their participation in this community. Even bloggers who do not care much about concealing their identities or privacy issues use pseudonyms as a marker of community membership. Some of these less-private bloggers even have fun choosing revealing pseudonyms for places (e.g. the blogger known as jo(e) blogs about New York City under the name Big City Like No Other), playing with this accepted naming convention. Still, while these pseudonyms are revealing they will not result in search engine hits under the real names. Thus, new community members may not need to expend as much effort as the initial ones did to determine appropriate pseudonyms and privacy conventions for their own blogs. Their choices may be largely guided by the established community norms and then finessed to match the individual’s comfort level with self-disclosure. Additionally, their beliefs about the need for pseudonyms and privacy may be largely shaped by the choices and experiences of those who began blogging before them. When asked about Krause’s comments, bloggers indicated that their form of blogging clearly was not something that Krause needed in his life, which was fine with them. They also felt that his status in the academic world, as a tenured white male, might contribute to some of his comfort blogging under his real name. I try to create some “order” with my identities by maintaining this “official” blog and my “unofficial” blog, but this too is a completely artificial construction of aspects of my identity, and it most certainly isn’t a complete or even partial picture of my identity. Other major critics of pseudonym use among these bloggers have focused on three main issues: the impact on non-pseudonymous bloggers, the use of blogs as a venting space, and trustworthiness. Thus, Dr. Crazy differentiates her blog from other types of blogs written by academics. This very topic is raised every few months within Blogademe, typically in reaction to an outside critique on another blog or in a news source. The Blogademe bloggers, in response, consistently rally to express how their form of blogging is simply not the same as blogging that academics might do as part of their scholarship or under their legal names and thus the two should not be compared. The second argument is typically levied against academics writing any type of non-professional blog, whether under a pseudonym or their real name. Ironically writing under a pseudonym himself, Ivan Tribble wrote a series of columns for The Chronicle of Higher Education (Tribble 2005a, b) warning bloggers that their actions meant that they were less likely to be hired into academic jobs. Tribble indicated a distrust of blogging in general, fearing that bloggers would use the platform to air their department’s dirty laundry. Others, however, have found that gossip is one of the least popular blogging styles (Technorati 2008), and most Blogademe bloggers avoid engaging in gossip and they will make only general comments about the state of their department or institution and only as is relevant to helping them work through a problem—not for the sake of gossiping. I trust the voice that I’m given. I don’t feel as thought I’m uncovering a great secret when I find someone’s identity. … The bloggers I read, I feel as though I know them, as if I trust the persona that’s being presented (interview). Thus, if some bloggers are, in fact, posing as someone significantly different from themselves (e.g. a 15 year old male high school student pretending to be a 35 year old female professor) then they are doing so incredibly well, and those who blog with them are not tremendously concerned about this issue. In my own off-blog contacts with the bloggers, which extends well beyond just those I have interviewed, I have found that in every instance the person has accurately represented him or herself in terms of gender, age, field of study, and job position. So, while the famed 1993 New Yorker cartoon may remind us that “On the Internet, nobody knows you’re a dog, (Steiner 1993, p. 61)” there do not seem to be many blogging dogs sitting at the computers in this community. First there was leaving comments and linking to people. You exist and I like you. Then there’s email. Yes, I would appreciate actual conversation off blog. Then IM. People reveal things about themselves there. You’re both mutually revealing things, taking a risk at the same time. (interview). Many bloggers did not originally intend to have such off-blog interactions. Flavia stated, “That’s something I’ve been surprised about—how really non-pseudonymous it is when you get past a certain level” (interview). As bloggers become more familiar with each other, their interactions extend to email, face-to-face meetups, and Facebook friending. These extensions allow them to explore topics and divulge information that they are not comfortable posting in a public forum. In some instances, Blogademe bloggers have become close in real life, collaborating on work and forming strong friendships and romantic relationships. Another form of trust relates to identity protection and extends throughout the community regardless of whether bloggers know each other off-blog. Bloggers will email each other if a post accidentally includes a real name or provides too many identifying details, warning the blogger that they are close to being “outed.” Bloggers trust each other to not reveal their legal identities when figured out, but to keep that information private. Throughout the community, bloggers share advice about how to best keep identities secure, which includes taking measures to prevent leaving a large digital footprint. Some bloggers have elected to not keep or make available blog archives, or to insert code that keeps their blog from becoming indexed by search engines. They also have filed requests to get their blogs removed from the Internet Archive Wayback Machine (archive.org) and register domain names with protected registry information. These actions indicate distrust not of their fellow community members, but rather of the millions of other people who may stumble upon a blog. As a community, these bloggers have developed their own set of norms, including many that impact identity issues. Individual blogging identities are not constructed in a vacuum, but rather are a reflection of the norms and practices of the larger blogging community. These norms are related to the shared concerns and interests of the community members. As academics, They are highly verbal people who often write with great irony and wit, which can be seen in their profiles, user names, blog titles, and blog posts as well as the clear development of written voice. The importance of name, title, and coherent voice in this community is likely a carryover from their scholarly work. In terms of interpersonal relationships and identity, the desire to communicate with others is metered by a bit of skepticism, which often is seen in academic environments. Accepted community members vet new members; it is readily apparent from post content how familiar bloggers are with academe and this particular community. Bloggers who are accepted in the community are rewarded with blogroll links and comments from others. Privacy issues are representative of a concern with a potentially large public audience that extends beyond the bounds of the known community. Bloggers are aware that in sharing with the community they do not risk their fellow bloggers violating their privacy so much as violating it themselves. In other words, they are vulnerable because they post in a public forum, not because the people to whom they speak may share their secrets with others. Privacy concerns are respected, with everyone aware of how delicate academic politics can be as well as the potential negative consequences of being “outed” to local colleagues. Thus, there exists a tension between having privacy and having community, with a general inclination to trust others in the community based on voice, prolonged engagement, and reciprocity. In turn, bloggers work on the assumption that others who are not part of the known community are unlikely to lurk on the blogs frequently enough to ascertain legal identities, nor are lurkers likely to have that intent. This study has shown how blogging identities are constructed from a nexus of verbal, visual, and structural elements and how those elements are affected by belonging to a community through the development of norms. When bloggers operate as part of a community their identities and their actions at least somewhat reflect the expectations of their audience, and in the case of Blogademe the audience is not a static or unknown one but rather a networked of interlinked bloggers and commenters who regularly share their lives with each other. The use of pseudonyms is a hallmark of this community, and bloggers must deal with the complexity of representing themselves accurately while at the same time protecting themselves from being readily identified outside the community. Such is the challenge of discussing potentially sensitive or personal details in a public, archived, and indexable format. Thus, bloggers engage in the act of juggling legal and blog identities. Bloggers represent themselves truthfully on their blogs, which is necessary to support the trust and reciprocity that are requirements of community. Still, they shield enough details via pseudonyms and omissions to feel safe and protected from being found by casual searchers. The findings from the study of this community can readily be used to help analyze and understand other online communities. Blogademe provides a rich example of how a group of previously unaffiliated individuals can come together online, create virtual identities, and loosely unite themselves via common interests. The organic nature of the community and how it formed and gains new members speaks to the power of online identity; it is the voices of existing bloggers that encourage and facilitate the involvement of new ones. Further, the development of identity norms has been natural and based on a viral movement of individual actions across blogs. In other words, one member’s decisions about how to enact a particular element of blog identity—be it username, blog title, profile, voice, or content—typically carries over to and is adopted or adapted by other community members. It is likely that the structural elements of how identity is formed and normed here are consistent with those of other, similar communities—namely those which are organically formed around a shared topic or practice with a large potential membership who have a sustained interest in the topic of practice. While this community may be unique in terms of the specific identity concerns and preferences of academics, the general concern for privacy in a public forum is a common one among blogging communities. For example, mommy bloggers often use pseudonyms for the safety of their children who figure prominently on their blogs, and bloggers who mention their jobs often use pseudonyms to avoid the ire and related consequences of their employer finding out. This desire for some shield between online presence and the physical world is a factor that keeps some people from participating actively in some online forums, and this study sheds light on how some individuals successfully navigate the tricky waters of identity management. In terms of implications for practice, and of particular interest to people who are trying to intentionally cultivate online community, this study illuminates factors related to trust and privacy concerns that merit consideration when determining community participation guidelines and identity management options. 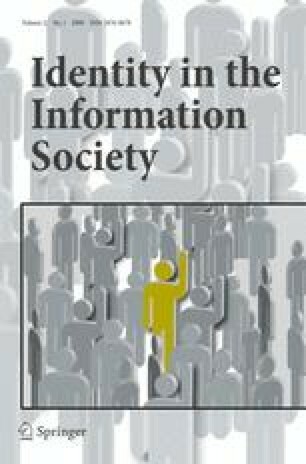 In closing, this study provides a glimpse at how identity is developed and presented within a particular online community, the elements that communicate those identities, and how the use of pseudonyms impacts trust, freedom of communication, and perceptions of privacy within the community. This community is not representative of all online communities, and future research should explore whether the findings in this study hold true in studies of similar communities. In other words, are the Blogademe bloggers a unique case or are their beliefs, norms and practices surrounding the development and presentation of a personal identity within a public forum common ones, shared by other online communities. Certainly it would be interesting and useful to an understanding of online culture and identity issues to determine if these findings hold true among bloggers who commune around a different set of interests or who represent different cultures, age groups, or levels of digital literacy. Thus, these findings might provide a point of comparison or triangulation for other community ethnographies or a launching point for more comprehensive survey research. kfluff. Tiny circle of friends. In: KulturFluff. 2006. http://kulturfluff.blogspot.com/2006/09/tiny-circle-of-friends.html. Accessed October 22, 2006. Madden M, Fox S, Smith A, Vitak J. Digital Footprints: Online identity management and search in the age of transparency. In: Pew Internet & American Life Project. 2007 December. http://www.pewinternet.org/pdfs/PIP_Digital_Footprints.pdf. Accessed October 3, 2008. Technorati. State of the Blogosphere 2008. In: Technorati. 2008. http://www.technorati.com/blogging/state-of-the-blogosphere. Accessed October 25, 2008. Tribble I. Bloggers need not apply. The Chronicle of Higher Education. 2005a. http://chronicle.com/weekly/v51/i44/44c00301.htm. Accessed March 16, 2006. Tribble I. They shoot messengers, don’t they? The Chronicle of Higher Education. 2005b. http://chronicle.com/weekly/v52/i02/02c00201.htm. Accessed March 16, 2006. Wei C. Formation of norms in a blog community. In: Into the Blogosphere: Rhetoric, Community, and Culture of Weblogs. 2004. http://blog.lib.umn.edu/blogosphere/formation_of_norms.html. Accessed October 1, 2006.